This card gives you access to your digital teacher’s resource on the Cambridge Elevate platform. With ready-made lesson plans, worksheets and a scheme of work all written by an experienced examiner and teacher, this digital teacher’s resource helps you save time preparing and planning. 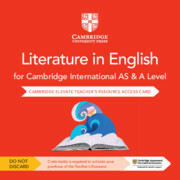 Combining a logical route through the syllabus with editable PowerPoints, advice for differentiation and tips for tailoring the material to your classroom, this resource is an essential addition to any AS & A Level English Literature in English teacher's shelf. Answers to coursebook questions are included in this resource. Your digital teacher's resource gives you plenty of materials to plan your teaching. Choose from editable Word files or PDFs for lesson plans and worksheets that you can adapt to the needs of your class. 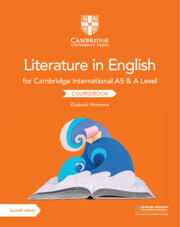 Helps you take an active approach to teaching AS & A Level Literature in English.